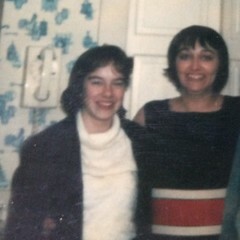 Me and my mother, circa 1980 – from a Polaroid! I went to lunch yesterday with another friend who is past child-bearing age (or at least, what most of us still consider such) and it was a study in familiarity and manners. What was funny was that the restaurant owner and the long-time server whom often waits on us knew better and just said how nice it was to see us. It was the newer staff who presumed that because we are females over the age of … ?, SURELY we must be mothers. I wonder if my younger friends have that problem? Look, I KNOW I’m not a mother. I am rather private and don’t care to share but so much, but I am childless by choice. How much worse would it be if I was in fact, trying to have a late in life baby without success, or had a private adoption fall through recently, and these presumptuous cads were wishing me a most inappropriate happy inapplicable event?! It ranks right up there with asking the stranger with the poochy belly when she’s due. In an age of political correctness and anti-discrimination laws for anything one can think of, where is the common sense and/or common courtesy? You know, it just hit me; we wouldn’t need so many laws if people just practiced the Golden Rule. 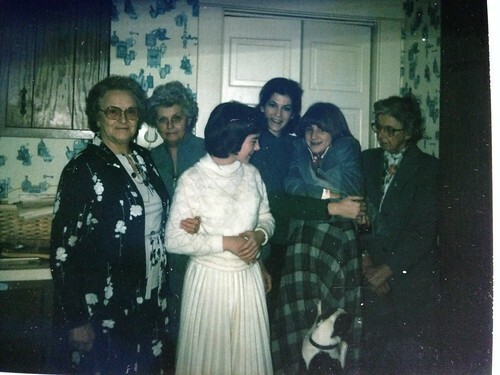 Same day… a RARE photo with (from L-R) my maternal grandmother, my Nana, me, a cousin, a friend, and my much-beloved “old maid” great aunt, and one of her “furkids”. Clearly, no one but Nannie (my grandmother) was ready for the photo, but I didn’t realize I had any with all three of those GRAND women in it! Oh, I am most grateful for the mothers in my life. They get so much of the credit for the woman I am today. I do think motherhood is a mostly thankless job, but the world should honor moms regularly, not just once a year. Co-parenting shouldn’t be a word or a concept; it’s redundant. It takes two people to make a baby, and it takes a village to raise one into a reasonably sane, functional adult. Parenting is a verb, a very active verb, and Dad, godparents, neighbors, friends’ parents, etc. should all be involved EVERY SINGLE DAY. I was truly blessed to have a large, extended family and a network of caring folks involved in my upbringing. But you know what? Even those who don’t get June Cleaver turn out okay. Look at Opie. Aunt Bea, Andy, Barney, even Gomer and all of Mayberry saw to it that little Opie grew up to be a gazillionaire who wasn’t just a former child actor, but a powerhouse in almost every aspect of Hollywood. I do hope those of you celebrating – your own motherhood or the mothers in your life – had a great day. We had a rare family meal, just the inlaws and me, and I know MJ really enjoyed having us all at one table again. And yeah, we should do that more than a handful of times a year too.